Our history began when Claire, as a vendor, began selling herb vinegars at the Lincoln Road Partnership Market in 1995, shortly after moving to Miami Beach. 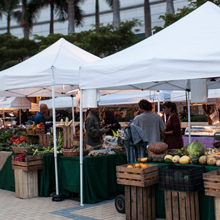 In 1996 the Partnership and Market were dissolved and in 1997 Miami Beach City management asked her to recreate the market and it became the Lincoln Road Farmers Market. The Market has become a weekly Miami Beach institution, with multiple vendors who offer their products every Sunday to residents and visitors alike.